It's been a while since I wrote about productivity. 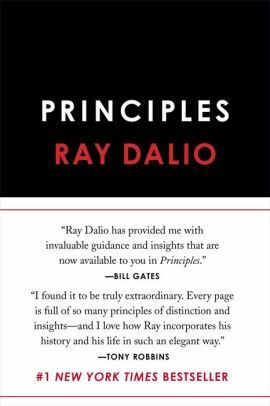 I'm currently reading a great book called Principles by Ray Dalio and there is a chapter about goals and how to achieve them. Since there is a lot of correlation with what I've written before, I decided to dedicate a post to this chapter and bring my own ideas to the table. Ray Dalio is a famous investor that started his own investment company Bridgewater from his 2 bedroom apartment and grew it into a billion-dollar company. The fascinating thing about Ray Dalio is not the wealth and success of the company but rather the way he did it. He ran his company as an idea meritocracy (watch his TED talk explaining this) where the best idea wins instead of rank or seniority. His company predicted the 2008 financial crisis and his clients ended up gaining money instead of losing money like the rest of the world did. Ray made an interesting video "How the economy machine works" that explains economy in an easily understandable way in only 30 minutes. He runs his work and life by a set of Principles that are described in his book. In the book, Ray describes a 5-step process to achieve your goals. First of all, your goals must be clear and put to paper. Make sure you prioritize your goals and focus on the most important ones first. Don't try to do too many things at the same time. Some people want to lead a healthy life, lose weight, do regular exercise. But they also want to enjoy life to the fullest, go binge drinking on the weekends and eat whatever they desire. There is nothing wrong with either of these goals but they don't mix well together. Decide what you want most and focus on that goal. When setting goals, don't think about what is possible or how you would do it. This is something you will do in the next steps. Don't limit your thinking and ambition by your fear of failure. Nothing in life is easy, there will always be problems. Ray writes that you see those problems as opportunities for improvement. Make sure you look at the real underlying problem and not only the symptoms. Having headaches is a symptom, there is something that causes those headaches. Again, the goal here is not the find solutions. Focus on identifying problems and writing them down. Make sure you look further into the root causes of your problems. Sometimes it is related to your own weaknesses. It is essential to accept that you are not perfect and have weaknesses like anyone else. The problem might also be caused by someone close to you. Don't ignore problems because you fear conflict. Problems can only be solved and goals can only be reached when you address them. The first 3 steps are synthesizing task. You can use any to-do list app or a notepad to record these. I like tools such as Trello because they help me visualize things better. But anything will do. Maybe this is a good time to look back and my older post about tools. Now is the time to find solutions to go around your problems. Design a plan and be meticulous about it. In the book, Ray compares the plan with a movie script where you will visualize who will do what through time. Start with a top-down approach but once you have the broader view, drill down and work on the details too. Use the plan to measure the progress. In a previous post, I talked about milestones. Be accountable for your progress and achieving those milestones. Be tough on yourself! One thing that Ray mentions is that you need to realize that making a plan doesn't need to take a lot of time. It needs to become a habit. Too many people, including me, have a tendency to jumping straight into the action and ignore the planning part. Realising that any plan is better than no plan is a key point to take away from this step. Probably the hardest part is to keeps pushing towards completion of your plan._ "Great planners who don't execute their plans go nowhere"._ Include metrics (or KPI's) to measure your progress and to make sure that you don't deviate from the plan. If something in the plan seems wrong, fix the plan first before continuing instead of just doing what you think is right in the moment. Having a fixed work habit can help a lot with getting things done. I wrote before about the power of habits and daily routines. Great achievers know exactly when they will get up, when they work, when they eat, when they socialize and relax. They often know in advance what they will wear and what they will eat too. Routines help you to get things done. Look at Elon Musk, Warren Buffet, Steve Jobs and other great achievers. They got a lot done because they created routines to help them stay on track. Step 4 and 5 are shaping steps. A great free tool to help you here is Asana. It will help you to document your plan, set milestones, assign tasks and set reminders. One more thing to pick up from the book: no one is perfect. The 5-step process requires a mix of different skills and you will probably not be great at all of them. That's perfectly normal. But to achieve your goals, you need to push through, admit your limitations and either improve your weaknesses or get some help. All of the big achievers I mentioned before had other great people helping them. Steve Jobs had help from many people, including legendary designer Jony Ivy. Warren Buffet has Charlie Munger. Elon Musk seeks out specialists in all new fields he is exploring. No man is an island. Find your own weakness and look for a solution. If you are bad at planning or keeping on track, you can always hire a coach or mentor for accountability. Or team up with a friend. The process described is meant to be an iterative process. You should regularly go through each of the steps again. Maybe your priorities have changed or new problems arrived. A perfect plan needs to be maintained and improved based on reality. But the most important things is to get started and do it. Don't wait for the ideal moment because that doesn't exist.